We have had a lot of changes happen lately and I haven't caught up on this blog enough to keep everyone up to date on everything. Here are some posts that are going to be coming up. I have a goal to be caught up by the beginning of 2013! Hailey is in diapers 24/7 - Not just regular kid diapers. These are Adult small "briefs." They hold better with the amount she is expelling. These are not an item covered by insurance. We go through 6 - 8 a day and they are not cheap. 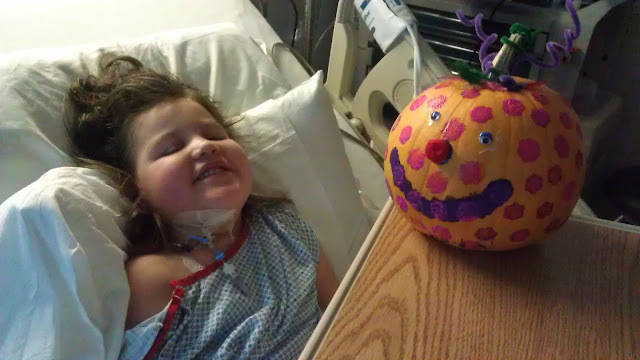 Hailey had a G-tube placed about 3 weeks ago. She is now being feed through a machine that runs the food through the tube into her stomach. The insurance only covers $2500 of formula a year. Formula is about $350 a month. With the G-tube you need lots of extra medical items. You need the feed bags that hold the formula that get changed every 24 hours. You need 60cc syringes to use to vent Hailey. You need: dressings, q-tips, bottled water, tape, feed adapters and venting bags. Our insurance still won't extent Hailey's Speech, Occupational, or Physical therapy. I have applied to medicaid and social security through disability and was denied. I then applied for the Katie Becket Foundation. I also filled out an application for Positively Kids respite. We don't have a wheelchair accessible vehicle so it's difficult to take Hailey anywhere on my own. She is nearly 4ft tall and 52 pounds. I am about 5'4". We still have to travel out of state for most of our doctor appointments and follow ups. That costs, gas, and hotel, and time away from work. It's seems like every time we turn around one of the cars we have is in the shop. With our 15 year old Blazer we needed brakes on the way to Utah fixed, then on the way back 10 days later we needed a new fuel pump...when it rains it pours. I applied for a private duty home nurse and my insurance said that Private duty nurses are EXCLUDED from my contract policy. To keep Hailey from getting bedsores we are constantly rotating and stuffing pillows under her. She doesn't have a hospital bed that does it automatically so most of my night is spent awake doing that every 2-4 hours. I haven't had this kid dressed in actually clothing in over a month and when I go to dress her she has NOTHING that fits anymore. We need to go clothes shopping for stretchy pants and winter clothes, so not to add pressure to the g-tube site until we get it changed from a foley to a mickey. I am going to learn how to make communication boards for Hailey. She is only communicating by moving her head for yes or no answers. When she does it takes so much of her energy to do so. Jessica....take a look at iPad communiccation board apps. There are several free ones. Don't know what you are looking for but it's a good place to start.